We are excited to present this photo as the first of what we hope will be many Memorial Bricks, taken from the Old Red Hill School House building, engraved with someone's name who attended the Red Hill School, or someone you just wish to honor in this manner. The engraved brick will either be placed in the Red Hill School Memorial garden area just above our Veterans Memorial Wall or you may place it in a display case or on your mantle to honor someone. 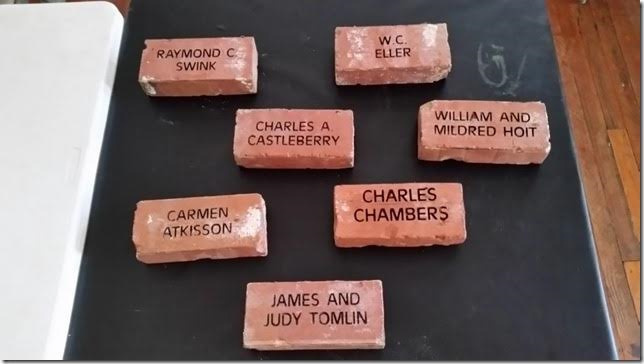 The sale of these bricks will be very helpful in helping us reach our Roofing Fund goal of $30,000. The memorial bricks are $125 each. Again, you may elect to have them placed in the Memorial Garden above the Memorial Wall or you may elect to take them to your home and put on the mantle or a display case. The names on the wall are $85 each. Be sure to specify the name(s) to go on the brick(s) on a separate sheet of paper enclosed with your check.